The Half Baked Lunatic | Space, Time, and the search for "Little Green Men"
The signal that the dish receives is not very powerful – somewhere in the range of a micro-watt of power (one millionth of a watt). However, you need to remember that you can put the antenna anywhere … in your front yard, in the back yard, on your roof; the network of satellites that broadcasts the signal to your house isn’t beaming a microwatt of power directly to your dish, it is putting out a microwatt of power for every 20-inch circular area across the entire United States! Only a very miniscule amount of the power transmitted from the satellite actually hits a dish, the rest is just absorbed into our lawns, rooftops, farms, lakes, and streets. The larger the surface area you are trying to cover, the more overall power you need to transmit to get the same power per square foot. Each surface of the room is 100 square feet (ten by ten floor, ceiling, and walls) so there is 600 square feet of surface area in total. The room is nice and bright and you can easily read a book in the corner of the room. So far so good. But let’s put the same 100-watt light bulb in a larger room – how about a room the size of a basketball stadium? Can you still read a book in the corner? Of course not! In your living room, you have 600 square feet of surface area, and with a 100-watt bulb each square foot of wall, ceiling, and floor receives .1666 watts (100 divided by 600). In the stadium sized room, you have many hundreds of thousands of square feet of surface area, and the light that hits each wall will be pretty dim. 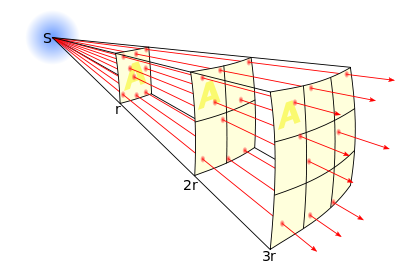 There is a formula that easily calculates how much power you will get, known as the “inverse square law” – each time you increase the distance ‘r’ in the image below, you have r2 the surface area for the amount of light (or radio signal) to be spread across, so the coverage gets increasingly weaker with greater distances. That’s all well and good, but there is another wrinkle to all this. You can “focus” the light (or radio transmission) so it’s not going out equally in all directions, and this is what our communication systems typically do. It’s easy to see that Satellite transmitters focus all their energy towards the Earth – none of it is actually broadcast out into space. But even the ‘terrestrial’ towers that transmit local TV stations are designed so that the maximum power is directed downward, towards the viewer’s homes – not up into space. That would be “wasted energy” that the TV station would have to pay for in their electric bill. But how narrow or wide do we focus the transmission? This becomes an acute issue when we send a spaceship out to explore our solar system. If we have a probe orbiting Jupiter, and we need to communicate with that probe, how “wide” of a beam do we send? If we know the EXACT location of the probe, we can send a very, very narrowly focused beam at low power. But if we just know “it’s circling Jupiter” then we need to send a signal that covers the entire diameter of the planet – and then some! – at a strong enough power level so that there is a usable signal strength (enough for the probe to receive and extract a viable signal from the background noise) … but the area we need to cover is absolutely huge! With the “narrow beam” signal, if our aim is off by even a slightest percentage of a degree, the signal will go right past the probe and not be received. Think of trying to hit a ping-pong ball with a laser pointer from ten miles away. With the “wide beam” signal, we need exponentially higher power transmission based on the inverse square law. Now let’s expand on that idea a little bit to really illustrate the problem of communicating with an alien planet. Let’s say an intelligent species on a nearby planet – only 50 light years away – wanted to send us a message. A quick check on Wikipedia reveals that Jupiter is 483.77 million miles from the sun. Using that as the radius, we can plug some numbers into the standard formula for the area of a circle, which is πR2, we get an impressive 735.23 quadrillion square miles of surface area to cover. For a transmission from a star 50 light years away, that’s actually a very tight beam! Look up at a star in the sky, and think about focusing a signal just on that star … and actually, hitting the spot where that star will be in 50 years! Let’s say that the aliens REALLY want to contact us, so they use a 1 Terrawatt transmitter for their signal (which is 1,000 gigawatts – roughly 1/10th the total electrical power generation capacity we have on Earth). Using the same methodology we used above with the light bulb in the room, we divide the 1 TW of power by the 735.23 quadrillion miles of surface area … and we get a nice 1.3 microwatts of power per square mile. This is the signal strength that would be received everywhere inside the orbit of Jupiter – so the Sun, the moon, Mercury, Venus, Earth, Mars, and all the empty space in between, would get 1.3 microwatts of power per square mile from the 1 TW transmitter. Remember that our home satellite system needs about 1 microwatt of power for a 20-inch dish, so picking up a signal that has 1.3 microwatts of power spread over an entire square mile could be a problem. However, the “very large antenna arrays” like what we have out in the New Mexico desert are far more sensitive than a home satellite dish, and could probably detect this signal. Note that this is making some wild assumptions … the numbers are only valid if the signal is coming perfectly perpendicular to the plane of our planet’s orbit around the sun, and many other details I’m ignoring here … but I think you get the idea: concentrating 1 TW, which is a LOT of power, directly towards our solar system, would still be a very weak signal for us to receive. The idea that our stray TV signals, which are very low power and not directed out into space, and certainly not “focused” on any one particular star in the universe, means that it is fundamentally impossible for aliens to intercept our TV transmissions. In fact, using the best technology we have, we could not build an antenna sensitive enough to pick up commercial TV broadcasts from the moon. Now apply the “inverse square law” and see how difficult it would be to get the signal on Mars. Or on Jupiter. Or outside our solar system. We are, however, sending signals into outer space with the specific intention of trying to get someone’s attention – but without knowing WHERE to direct the signal, and with the limited power we are transmitting, the chances of anyone intercepting the signal are quite low. There is another factor in all this, however, which can’t be ignored: we’ve only had the technology to be able to send and receive radio signals for about 100 years. During this entire 100-million-year welcome message, aimed directly at us, the dinosaurs on Earth would not have responded to their call. On the other side of the spectrum, another nearby planet might just now be going through a phase where life is starting to develop; and if it takes life on that planet as long as it took life on Earth to be “radio capable”, we should be hearing from them in about 3 billion years. We have pondered the question for millennia: is there life anywhere else in the Universe? Is there intelligent life? Is there intelligent life that has developed the technology to send and receive radio signals? Is there intelligent life that has developed the technology to send and receive radio signals that overlaps human’s short tenure on Earth? Is there some other technology besides radio that is being used by other species for interstellar communication, like the "sub-space transmission" used in the Star Trek TV series? Can technically advanced aliens create a much higher power signal that we couldn't miss, like modulating the output of their entire star, for example? The answer is that we really just don’t know. We can easily imagine such possibilities, but without any data, we’re just making wild guesses. We can fantasize about Little Green Men that are immortal; they know everything and see everything and have amazing technology and have been just waiting for us to develop radio communication capability, and they have already sent us a message that will arrive … any day now. It’s great science fiction, but we have absolutely zero evidence to support any of it. No matter what, the evidence we do have says that even if they do exist, the odds of us discovering alien beings in a relatively short timeframe, let’s say a really short timeframe … within the next 10,000 years or so … is pretty slim.